TEL AVIV, November 14. /TASS/. 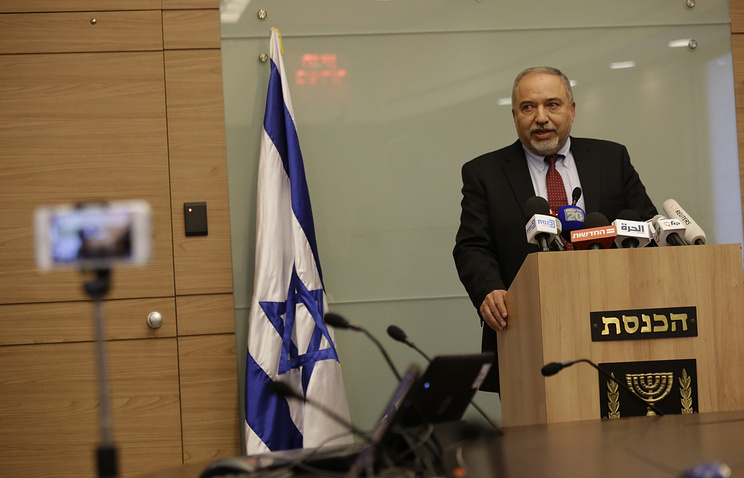 Israeli Minister of Defense Avigdor Lieberman has stated on Wednesday, addressing the media, that he resigns from his post. "Yes, I resign from the post of the Israeli minister of defense," he said. "Our party Yisrael Beiteinu is leaving the government coalition." Lieberman’s speech was broadcast by Israel’s main TV channels. The politician explained his resignation by the disagreement with the government’s actions against the Gaza Strip, which were not harsh enough. "In terms of security we had to end our actions in the Gaza Strip. The strike we carried out on Gaza’s infrastructure of terror was not enough, to my mind," he said. "If I remained minister of defense, I don’t know how I would look in the eyes of southern Israel’s residents." "In the last months we (Israel - TASS) have been conducting the totally wrong policy," Lieberman added and supported the urgent holding of early parliamentary elections. The Yisrael Beiteinu party received six mandates in the current parliament after the May 2015 election, but lost one seat due to the withdrawal from the faction of one member. The current government coalition includes the Likud party, headed by Prime Minister Benjamin Netanyahu, which controls 30 seats in the parliament, and four political forces: Kulanu, led by Moshe Kahlon (10 mandates); the religious parties Shas (seven seats) and United Torah Judaism (six seats); along with the Jewish Home party (eight seats). The composition of the coalition made it possible for the government to control 61 out of 120 parliamentary seats. It is the minimal necessary amount which makes it possible for the prime minister not to declare early elections. The powers of the current parliament, elected for a four-year term, expire in 2019.